Millions of stars illuminate the night sky. No noise. No traffic. Only the wilderness. You just had a splendid meal of arctic delicacies with your loved one. You step inside your warm cabin, pour a glass of sparkling wine for you two and lie on your bed below a heated glass roof, chatting about the snowshoe walk you did and the reindeer of the village you fed in the morning. And then, the auroras start to dance! First, green glow in the northern horizon, then an arc, brightening up to a spiral of color on the night sky… You can see it all from your Aurora Cabin. This is Aurora Village. Hundreds of kilometers above the Arctic Circle, in Lapland, the north of Finland. RIght on the aurora zone. 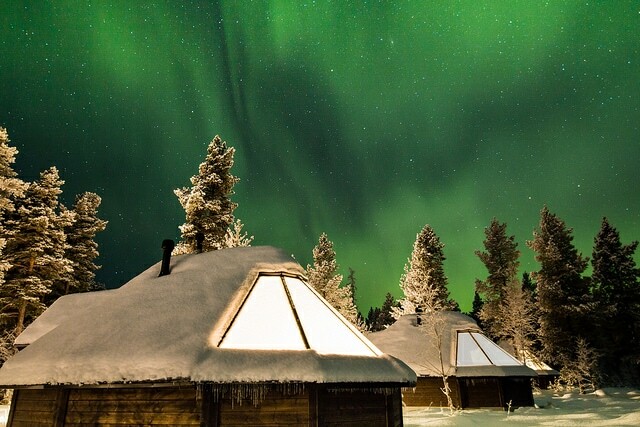 We have 25 Aurora Cabins that offer you a spectacular panoramic view to the Northern sky from the comfort of your bed. Enjoy the athmosphere and delicacies of Restaurant Loimu. Taste the pure ingredients of the most clean nature in the world! Need something to do? Check out the great variety of our winter activities. There’s something to do for every day of your stay. We enjoyed a lovely weekend break at Aurora Village in February. The cabins are beautiful and sit a good distance from each other. The view from the ceiling windows is amazing! The property was extremely beautiful and everything in the room from the bed to the accessories was selected very tastefully. The host was really helpful and friendly. Wish we could spend more days here. The staff were absolutely amazing! We were warmly welcome when we arrived. She led us to our cabin, introduced how to use the facilities and made us feel like home. Send us a message with your email address and we’ll get back to you as soon as possible.